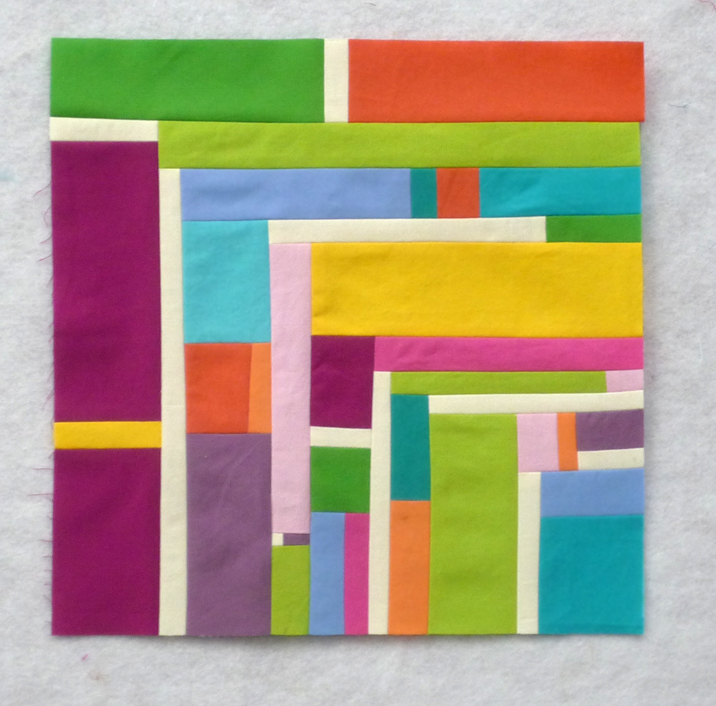 I just had to revisit my initial post for the Quarter 1 Finish-A-Long, hosted by Leanne at She Can Quilt. I couldn't remember all the things that I said I'd work on finishing. And as mid-February is sneaking up on us, I can quite definitely say that I'm headed for failure. There is something about the appeal of a new project. Or at least one unearthed after many moons. I hit a rather arduous deadline on Thursday which had been causing me more stress than I like, and to celebrate I spent all day Friday working on 1.) bee blocks, 2.) the PMQG block-of-the-month from the January meeting as well as pressing fabrics that I prewashed up to 2 months ago (if not more). 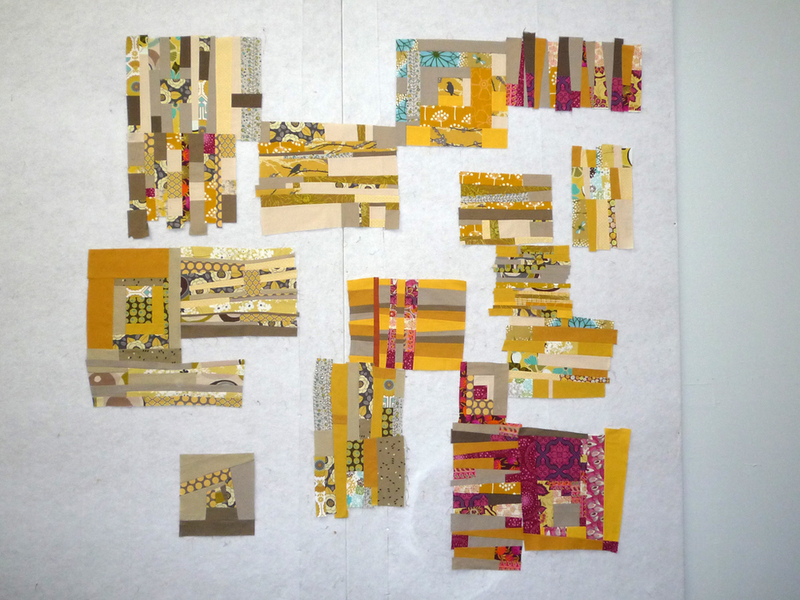 PMQG Jan BOM - Has anyone NOT yet done the scrappy trip along blocks?? When that was all complete I stood looking around for something to inspire me. Oh yeah, I keep forgetting to bring back the extension cord and power strip for the sewing machine I'm using to quilt my icy-cool diamond quilt AND my secret wall-hanging, so those are on hold until I get myself together enough to bring those back to the studio. Time is ticking, too. And sitting there, in the little fabric drawer just underneath the one from which I took the wadded up fabrics to press nicely, was the bits and pieces from my improv bee quilt, for my month of the Design Camp 2 [Think Outside the Block] bee last summer. At some point last fall I played around with the blocks I had thus far on my design wall, but not having them all back it was just a test. It's now been a couple of months since I received the last of the blocks from my bee-mates, and it all went straight into the drawer for future consideration. Apparently that future is now. The blocks and fabrics beckoned to me, the iron was hot (literally and figuratively)... it's time to break these bad boys out! The next step is to start filling in the blanks. I want to keep a fair amount of background "negative space" going on, but also have so many prints that I still want to incorporate. This will be one heck of an organic process and I wish there were a good way of keeping the block arrangement and size more or less as is without dominating my design wall for weeks. 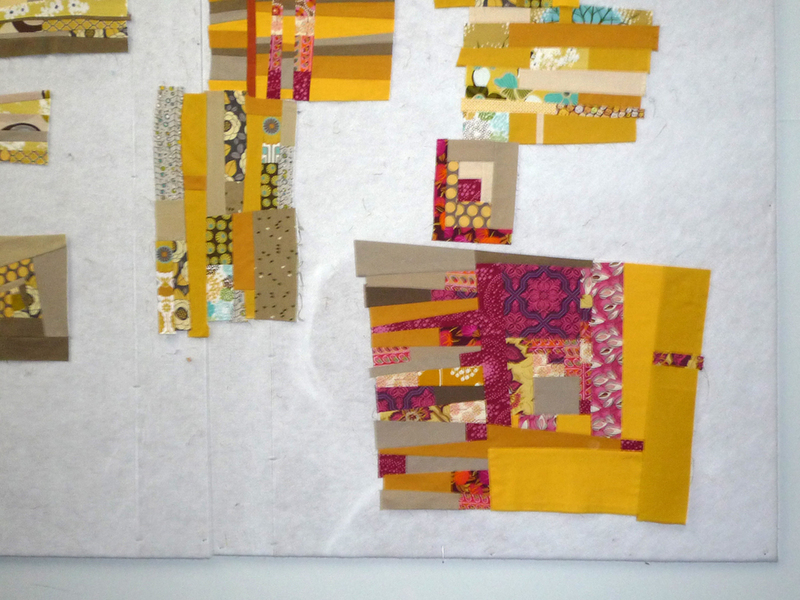 Is that going to be the motivation to busta move on this quilt top?? I left yesterday evening with one little corner coming together, and am looking forward to playing some more with the rest of it in the next few days! Am I the only one getting completely sidetracked from the lists I made a mere month ago?? One thing to remember is that we do this for the love of it, and if we're lucky to have something to create using that energy, all the better.